Manfred Fricke, Berliner, has been producing interesting and inexpensive synthesizers, sequencers and drum machines for many years, yet his company, MFB, is hardly known in the UK. With austerity the latest government scare-word and our wallets under more pressure than ever before, the time must be ripe to address that oversight. 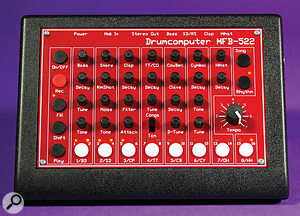 Let's begin by introducing two new analogue 'drumcomputers', which, to give you some idea of MFB's longevity, hit the scene 32 years after his first! Although Mr Fricke isn't making explicit claims, there's more than a scent of two classic beatboxes in the air. The MFB 522 could easily be viewed as a miniature homage to the TR808, while the MFB 503 is — tonally at least — not unlike a TR909. Fortunately, there are enough differences that we can treat them as original machines rather than clones, and at just €300 each (approximately £220 at today's exchange rates), they're probably the most slimmed-down analogue drum machines you can buy. Is there a catch? To answer, let's take a look at the MFB 522. Measuring approximately 175 x 125mm and weighing little more than a mobile phone, it's a drum machine you can pop into hand luggage or a pocket. The 522's audio outputs are all 3.5mm mini-jacks. Viewed positively, this means there's room for a decent number of them — four in total, plus the main stereo out. This is ideal for processing the kick, snare, clap and hi-hat separately. Plugging a jack into an individual output removes that voice from the main mix, an action that could also serve as a rough and ready instrument mute. The isn't much room left over for connections; those remaining are a single MIDI input and the external power-supply socket. Since the review model came direct from Germany, it arrived with a Euro-wart that sat, shakily, in one of my many adaptors. It's funny how, no matter how many of these things you acquire, they never fit properly! Sadly, given its cute portability, there's no battery option. As black plastic boxes go, the 522 felt fairly robust squatting on its four rubber feet. After applying blobs of Blu-Tack to ensure it stayed put, I was ready to begin. The tiny red panel holds no less than 25 miniature black knobs. There's a larger knob dedicated to tempo, a switch to select toms or congas, and buttons filling the remaining space. The most visibly obvious controls are the eight white step buttons, and if eight seems a weird number for an X0X-style drum box, here's where an unusual compromise comes in. If you look above the buttons, you'll see 16 yellow LEDs. Each shows a step's on or off status. The odd keys are accessed with a press of a single button, while the even steps need an extra key, Shift. If you think this sounds less fun than it ought to be, I wouldn't disagree. After that operational blip, the 522 is refreshingly direct. What you see is what you get, although actually seeing the position of those tiny knobs is going to be a challenge in dimly-lit clubs or studios. Time for a microdot — of white paint on each! 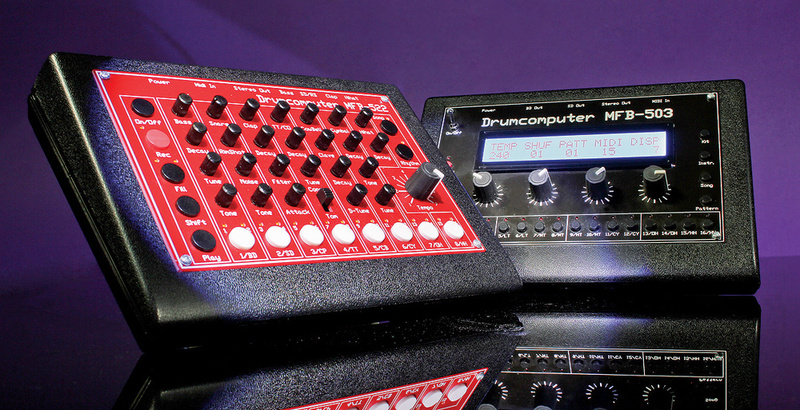 The knobs are similar to those of the Korg Monotron range, but with more variation in their quality. On the review model, some were smooth and loose, while others were a bit like me these days: stiff and reluctant to move. Spidery white text informs you of the 10 percussion voices, their names well known from Roland's TR808 or CR8000. Prepare to unleash cowbell, toms and clap, plus a boomy bass drum, snare, cymbal and more. The most blatant 808 omission is, or are, maracas. It's a loss that I, for one, can heroically bear. The 522's back panel sports individual 3.5mm outputs for the hi-hat, clap, snare and kick drums, a stereo output, a MIDI input and a socket for the external PSU. An analogue drum machine should offer unfussy control over each drum's main sonic elements. But even before that, there are expectations about the sound and how it should move the studio air. I've provocatively mentioned Roland's TR808 and there are obvious similarities, yet right from the start I felt the MFB 522 also had its own character. Not inferior, just a little different. Naturally, I started at the bass drum, which was instantly formidable. Like a kick from a flatulent mule, its low, almost-sinewave boom has the kind of presence the 808 is famed for, but with a cutting initial click. The click can be tamed by backing off the tone control, and if you increase the tone and shorten the decay, the result is sharp and snappy. The bass drum's pitch can plummet to almost subterranean; when the decay is then cranked up to its maximum (over 600 milliseconds), better keep a wary eye on your sub level or risk unscheduled bowel movements! The snare sits somewhere between a TR606 and a TR808, its noise and tone controls adding welcome 'tailorability'. With noise fully turned down, the snare is quite boxy, the tone control setting the balance between a slack and tight tuning. It's a plenty-usable snare before you invoke external processing, plus there's always the well-trodden path of mirroring it with claps. It's heresy I know, but I prefer the MFB claps to those of the 808 itself — they're more versatile. If you increase the decay, consecutive claps smudge seamlessly into each other. Alternatively, short and barking claps cut through reliably every time, with a filter to add subtle high-end cut and an attack control to shorten the initial decay. Some of the drums have alternate voices. The snare's secondary voice is a rim-shot, and also on offer are a shortened bass drum, short clap, conga and clave. There's no problem using these secondaries in the same pattern as the main voice, they just can't share the same step. All the remaining drums add their own coloration, from the cowbell's atonal clank to the plinky clave, thuddy toms and bonky congas. My flippant adjectives aren't meant to undermine the contribution each makes, which is considerable, unless, perhaps, you have an aversion to latin rhythms and frilly shirts. I noticed that when I turned up the cymbal's tune control there was a constant drone just audible. It's also present at lower tunings but not so obvious. Personally, I wasn't so keen on this strange, synthesized cymbal anyway, at least in its cymbal role. However, by setting a very short decay you get a perfectly usable second hi-hat out of it. Pattern programming is simple enough, — within the limitation of eight buttons for 16 steps, anyway. To edit a pattern, hit Rec and the key corresponding to the drum required; press the key twice to reach the alternate instruments. You're now in record mode, ready to activate the steps of your choice. To create a pattern of less than 16 steps, a cool trick is to trigger the open and closed hi-hat on the same step. It's neat and it works. In keeping with tradition, there's an accent track; it's another key combination, this time Rec and Shift held together. The amount of accent is fixed and it applies to all instruments on accented steps, but, nevertheless, it's responsible for injecting much-needed movement into otherwise straight rhythms. A further bonus is negative accent, summoned by pressing Shift a second time. Shuffle is provided in just three fixed amounts. It's a global effect, inactive on power up, its charms engaged by pressing Shift and Play repeatedly. Shuffle didn't sound especially natural; perhaps my patterns needed those maracas after all! Up to 72 rhythm patterns are instantly on hand, all easily overwritten. Selection is made with the Rhythm button and step keys, the new pattern kicking in as soon as the current one ends. This is after eithet 16 or 32 steps, because each pattern has a second bar, or Fill, to call on. But that's as complex as rhythms get (there are no triplets, for example). You can, however, assemble patterns into sequences of up to 64 steps, making a total of eight songs. Playback, disappointingly, stops if you spontaneously switch to song mode. Without a MIDI output, there's no way to offload songs or patterns for archival purposes. Nor can the 522 ever be your master clock. However as there's no tempo display it wouldn't be the ideal master anyway. The MIDI input is invaluable though, bringing with it the opportunity to sync to an external MIDI clock and to control each voice using velocity. Dynamics from a set of MIDI drum pads can really enliven these simple analogue circuits. It's the same size and weight as the 522, but the 503 looks and behaves very differently. The front panel is a curious collection of wee black buttons skulking on a black background. This must be approaching the smallest surface on which 16 step buttons could be placed and remain useable. Tiny though they were, I was encouraged by their positive action. At each corner, there's a panel screw roughly as wide as the buttons themselves, while the protruding power switch seems a bit of an ergonomic anomaly. If I can rein in the tongue twisters for a moment, powering up reveals a clear blue screen with white text that's roughly aligned with rotary encoders underneath. The four encoders are your sole means of tweaking every drum-specific parameter of every instrument, in marked contrast to the dedicated controls of the 522. The leftmost encoder is initially for tempo adjustment, its range an impressive zero to 240 bpm. The zero setting doesn't mean dead stop. Instead it's a fast and logical way to switch into external sync mode. There's no MIDI output. Anyone who owns both of these petite thumpers and dreams of syncing them will require a third device as master. Here, the audio outputs are all on quarter-inch jacks, which reduces the space for individual outputs to just two: the bass and snare. The main audio signal escapes into the wild via a stereo jack. On both drum machines, there's no user-controlled panning; each drum is in a fixed position. Having applied fresh Blu-Tack to steady the Euro-wart, I switched on and learned that the 16 chase LEDs are red this time. 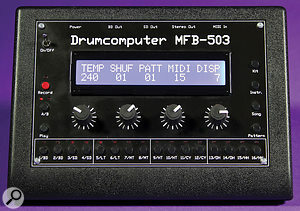 The display helpfully indicates the current pattern number, MIDI channel and shuffle value, showing at once that the 503 has more and groovier shuffle options. Ironically, there are fewer percussion voices to shuffle with. There's no dalliance with latin frippery, the emphasis instead being on five butch but conventional analogue voices (bass drum, snare and three toms), plus two that are sample-based (cymbal and hi-hat). Incorporating samples is a trick the TR909 also pulled, and it's the one that most sets the 503 apart from its red-faced sibling. However, 909 comparisons only go so far. Unlike Roland's enduring beauty, the 503 has only one cymbal, and there's no clap or rimshot. Based on this relatively spartan palette, it seemed like overkill to find 90 user drum kits and 90 patterns on board! Patterns are divided into two parts — or bars — known as A and B. With a few button presses, these play individually or consecutively. As well as note triggers, a pattern stores the edited parameters of its instruments and, as before, patterns can be strung together, forming up to 90 songs! It's a bit mind-boggling, actually, but full of performance potential. The MFB 503 isn't instantly accessible but, by pressing buttons on the right hand side in conjunction with the step keys, you can select and interact with patterns, kits, instruments and songs by number, all without stopping the music. It's under the covers that the action really takes place, though, the added complexity introducing an occasional software glitch. For example, sometimes I chanced across a state where the LEDs showed part B playing when it was really part A. Or, if I selected a particular drum or kit to edit, the text strings on-screen either didn't appear or were incorrect. But that was about as troublesome as it got. At the back of the 503 we find a MIDI input, a stereo output and dedicated bass and snare drum outputs, all three of which are on quarter-inch jack sockets, and a connection for the external PSU. Along with its volume, each chosen instrument's editable parameters usually fit onto a single screen. These typically include decay, tuning and amount of pitch sweep, but in the case of the bass drum, the options spill onto a second screen. In that case, the extra values (drive and attack) are accessed by pushing the first encoder. For all other drums, pushing the encoder acts as a mute. When any instrument is muted, a small dot appears in the display next to its volume. For me, the 503 is all about powerful, raw kicks. They have more than a hint of 909, but can be pushed in more directions. Its decay is longer than the 522's (at over 1.5 seconds) and the drive function spits aggression like a wound-up terrier. If you're especially perverse, you can make the bass drum into a disco tom by cranking up the pitch sweep and setting decay to maximum. At the other end of the scale, you can achieve a vaguely 808-like, deep, amorphous boom. While the three toms are simple and unremarkable, the snare is fat and classy. Its tuning, decay and amount of noise are all readily adjustable and despite the snare's pitched component being rather characterless by itself, it morphs into a perfect composite as the noise level is raised. Two different samples are available to the cymbal and hi-hats, a mix parameter blending smoothly between them. The cymbal's tuning also affects the noise component of the snare and the open and closed hi-hats have independent decays. We're still in familiar X0X territory but, in a further twist, there are two possible instances of each drum to choose from. These aren't alternate sounds as per the 522; the second instances are accented versions of the originals. In drum programming as basic as this, the importance of an apparently minor addition such as accent shouldn't be underestimated. Keeping with MFB's simple formula, patterns can be shortened by triggering the closed and open hi-hat on the same step. Having auditioned the relatively luxurious selection of 15 shuffle settings, your choice is saved along with the pattern. Aided by the display, song mode is far easier to use than on the 522. You select the song, hit Record, and enter pattern numbers one by one, confirming each as you go by pressing the leftmost encoder. The only other choice for each song step is whether you want the A or B pattern. The MIDI implementation has exciting hidden depths. True, you can't select kits or patterns remotely, and sometimes triggering from MIDI gave me unexpected results. Specifically, the lowest velocities produced occasional "pops” rather than an accurate trigger. But there are ingenious extras that more than compensate for any peculiarities. For example, in addition to regular voice triggering, you can play each drum chromatically over an octave in 12 different tunings. For the cymbals, different mix values are mapped over the notes instead of pitch changes. However, the real joy is in the extensive allocation of MIDI Continuous Controllers. There are 30 of these in total, covering every drum parameter. This full and extensive remote control transforms the 503 into a powerful drum module. When even Roland's minor creations are changing hands for silly money, MFB's miniature drum machines look like the products of a shrewd mind. They punch well above their weight, and even if they do ride on the coat-tails of two classic Rolands, they have enough character and identity to be attractive in their own right. With an interface so scaled-down, simplicity in sequencing is a given, but if you feel the urge to be more elaborate, you can trigger the drums over MIDI. In the case of the 503, you can totally reprogram its tones and levels, or even play simple bass lines. Neither has a main volume control, but both have hot and gutsy outputs, and although they're not completely noise-free, the signal to noise ratio is good and those individual outputs are a godsend. Undeniably built to a cost, the MFBs handle surprisingly well, with portability and familiar sounds forming the bulk of their appeal. During this review, I switched favourites at least twice. Currently, I prefer the 503's kick and snare, step buttons and extensive MIDI spec. But it's the 522 and its plentiful outputs, broader collection of instruments and more generally tweakable interface that wins for me, just, on points. In an ideal world, they'd be larger and chunkier, their controls top-quality and confidence-giving. But the costs would inevitably soar, and maybe more than their desirability could keep up with. Stripped down to the essentials, these charming and distinct analogue groove-makers are close to being impulse buys. The only difficulty may be deciding which you prefer. 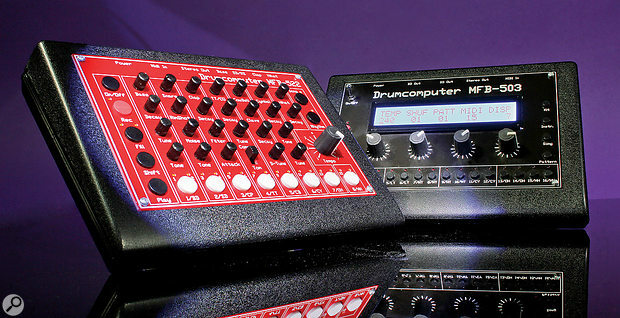 There are very few analogue drum machines being made today, and fewer still in the price bracket of these two. Vermona produce a kick module for a fraction under the price of a complete MFB, while Korg's cheaper, battery-powered Monotribe with its synth and basic analogue drums doesn't offer anything like the percussive range on offer here. Assuming you want to avoid sample-based drum machines, there's a steep hike to the next price bracket and the heady heights occupied by Jomox or Acidlab's Miami. They're certainly reminiscent of classic Rolands, but have their own charms too. The 522 has instant access to every parameter and a generous number of individual outputs. 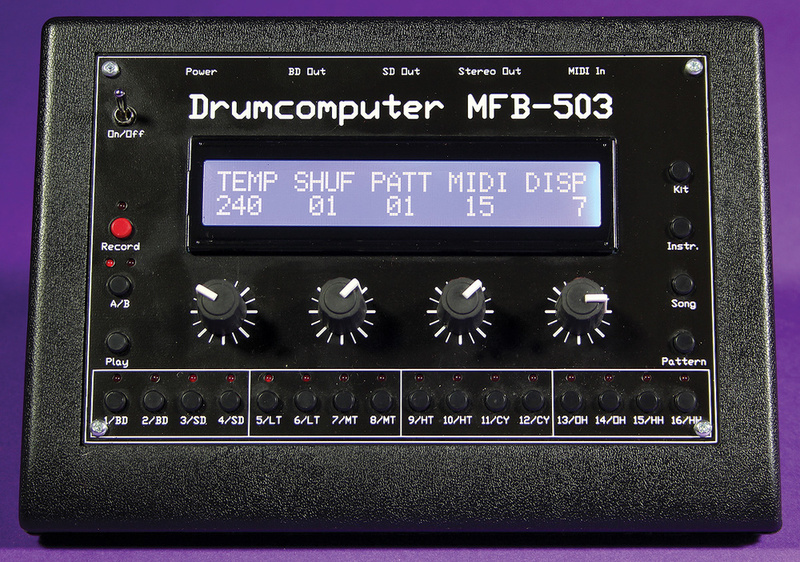 The 503 has MIDI control of every drum parameter. 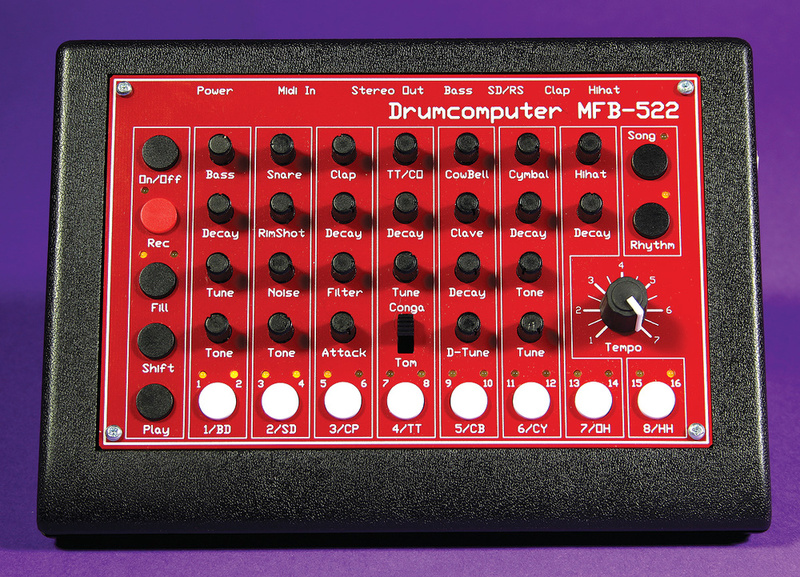 The MFB522 is an excellent drum box bursting with analogue life. Its controls are live and tweakable, its many individual outputs further boosting desirability. At the price, hard to fault. With a better-than-expected MIDI spec and individual outputs for the kick and snare, the MFB503 also represents superb value. MFB 522 and MFB 503, £226.81 each. Prices include VAT. SchneidersLaden +49 (0)30 9789 4136. MFB 522 £226.81, MFB 503 £226.81. SchneidersLadan +49 (0)30 9789 4136.